niCE coolers (formerly Meadowcraft Coolers) are an interesting brand, to say the least – we stumbled across them just a few months ago from a friend down in Florida who tipped us off to ‘some new rotomold company out in Alabama’… and being the nerdy cooler wizards we are, we had no choice but to take a closer look and check them out for ourselves in this in-depth nICE Coolers review. Having seen and tried out pretty much everything out there, for better or worse we’ve become a little jaded and are admittedly a bit skeptical whenever any new premium cooler hits the market nowadays. However, before even digging too deep into the construction and design of the things, nICE’s lineup earned some points in our book just based off looks and aesthetic design alone. And once we did roll up our sleeves and take a good look at construction, engineering, and performance, we found the coolers to be chock full of integrated, well-designed features – a breath of fresh air in a world increasingly full of coattail-riding junk. Needless to say, we didn’t have any hesitation about giving the brand some fully-deserved coverage here on our site, in the form of a complete review. Although the coolers are actually made in China, as far as we know they’re wholesaled out of Meadowlawn’s distribution warehouse in Wadley, Alabama, and as of the time of this writing are well-stocked and ready for shipment. nICE Coolers are designed, constructed, and marketed as ultra-high performance coolers in the same mold (not literally … no pun intended) as YETI (more on Yeti here), albeit substantially less expensive. 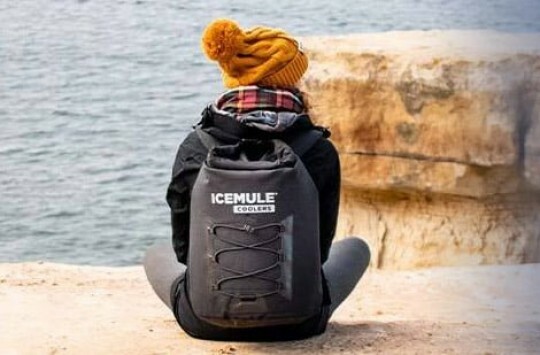 First, let us be clear that some of these YETI imitators over the years have gone on to see great success and have equaled – or even surpassed – YETI in terms of performance (see Cabela’s Polar Cap, RTIC, etc), while other lesser-quality imitations are better off sitting on the shelf down at the local dollar store. 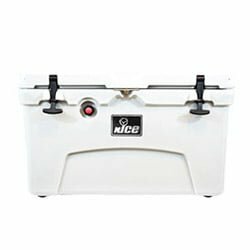 Based on the experience we have with them so far, nICE Coolers definitely belongs in the former group; fantastic durability, good build quality and ice retention, and yes, they really are about half the price as YETI’s. 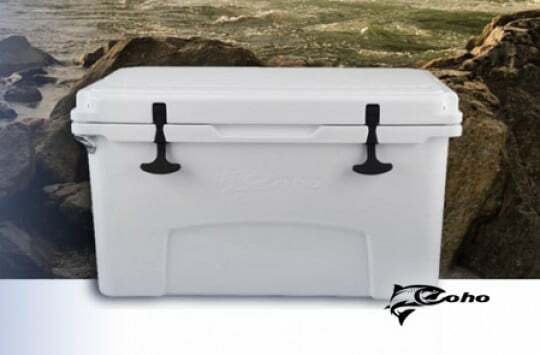 Like all premium rotomolded coolers, nICE ice chests are built with a thick, ultra-durable polyethylene body that sandwiches about 2” of high-density insulation foam throughout – the absolute key to success for prolonged ice retention in harsh conditions. TIP: Check out how to increase ice retention using some of the best ice packs or dry ice. While it was clear just by doing a quick once-over that the nICE build quality was up to snuff, the thing that really sucked us in and impressed us was the well-designed array of integrated features – not a single one of which felt under-built or out of place. Fortunately, it seems the thing nICE paid the most attention to as far as design is one of the most important aspects of cooler functionality, period: the gasket. 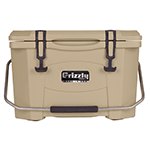 Every nICE ice chest has a fully recessed, 360-degree freezer-grade gasket that – unlike other ‘YETI imitators’ – actually has some proper seal to it when you lash it down. As soon as the T-bands are secured into place, you can feel the negative pressure seal form between the cooler and outside air – trapping cold inside and keeping the heat out. Continuing our nICE vs Yeti debate, the pressure-relief valve is another clear-cut indication of a good seal, and is something that YETI coolers lack entirely. It might look a little odd sitting there on the outside of the cooler, but when you press the valve in you can actually feel and hear air entering the cooler, making the lid way easier to open than a YETI. (A hard-to-open lid is of course sign that there’s a good seal, but it can be legitimately frustrating and you can just about rip your fingernails off trying to open up rotomold coolers without a relief valve). nICE Coolers have also found a way to jam just about as much functionality as humanly possible into their lids. The non-skid, dermatoglyph surface lets you use it as a cutting board and/or casting platform with equal ease, and we love the dual cup holders too (every cooler should have built-in cup holders, or as an add-on feature like Orion). Oh, and the cup holders have cleverly-designed drain notches that keep condensation from puddling up, and there’s also a built-in ruler and designated fishing rod holder mount on the lid too (rod holder not included). Definitely above and beyond the competition here. 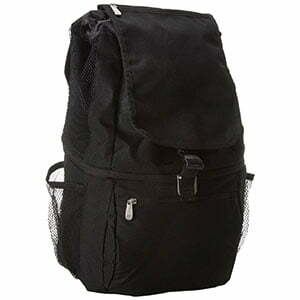 TIP: If you are serious fisher check out our top picks in fishing coolers and insulated fish bags. As far as the hinge and latch system, the heavy-duty T-bands and the built-in, dual stainless steel pins are right on par with YETI – no doubt about that. 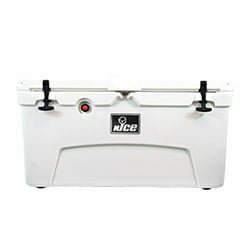 nICE ice chests also have attachment slots on either side of the lid, which are used as tie-down points to lash the cooler in place in your boat or truck, or to install removable band handles for 2-person carrying. The slots can also be used to fit add-ons like rod and beverage holders, and the super cool thing is they fit the YETI brand attachments. 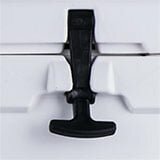 Every nICE cooler comes with a built-in bottle opener, which also doubles as the padlock hook for locking up your ice chest and securing it shut. 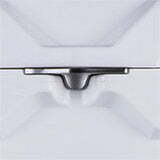 The nICE Integral Handle is another well-thought-out and well-designed feature, with built-in notches on the cooler lid that lock it into place when it’s swung all the way up. The Integral Handle is pretty much only for 1-person carrying, but like we said you’ve also got the option for the removable band handles that slot into the sides for easier 2-person carrying. 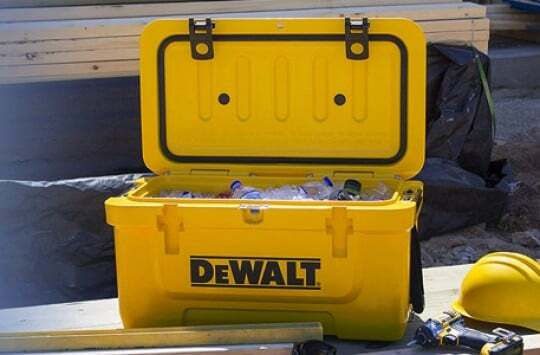 In terms of durability, nICE ice chests will hold up to YETI standards – don’t get us wrong. Like we were saying earlier, our buddy down in Florida uses his as a casting platform on the bow of his boat, and says it’s more than strong enough for both him and his fishing partner, both of which are over 180 lbs. Also, the super-grippy anti-skid rubber feet will make sure that that sucker doesn’t slide around anywhere on the boat deck. (We will say that YETI’s non-skid feet are screwed into the bottom of the cooler rather than glued in, so they’re probably a bit more durable in that regard than nICE). The main thing we like about nICE coolers vs YETI is that pressure relief valve we were talking about. Even though it looks kind of silly and gimmicky (like those pump tongue Reebok’s back in the 90’s), we love how functional it is and how easy it makes it to open the lid, even after hours of negative pressure. Oh, another significant improvement that nICE has on YETI is the dermatoglyph layer they’ve incorporated into the non-skid lid, allowing it to be used as a cutting board without having to worry about destroying the whole thing. Like YETI’s, nICE Coolers also have a threaded drain plug that can hook up to a standard garden hose, but the new guys one-upped the masters yet again by adding a stainless steel chain to the plug – never have to worry about losing or misplacing it. And last but not least, don’t forget about all the integrated features that are built into the cooler lid (like the cup and rod holders) – none of which you’ll find on a YETI. 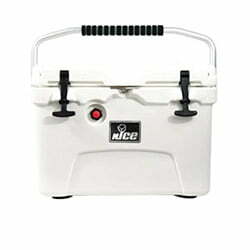 Wondering where to buy nICE Coolers? Yeah, we actually had some trouble too finding a new Seafoam Green 45-quart that we wanted to order. 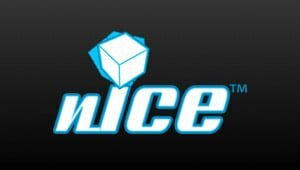 Our first-choice recommendation is to always check Amazon first, as ever since we’ve been keeping an eye out for them, they’ve had a really good selection of different size nICE’s in-stock and ready for shipment, at insanely good prices. Well, if you haven’t figured it out by now, you could probably say that we’re the newest additions to the increasing swarm of nICE Coolers fans. 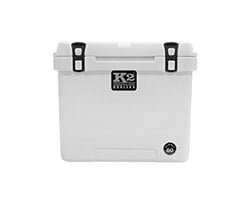 Unlike other YETI imitators, these ice chests live up to all their claims of performance and durability, and literally are about half the price of the top-name brands. Definitely a recommended buy in our book. 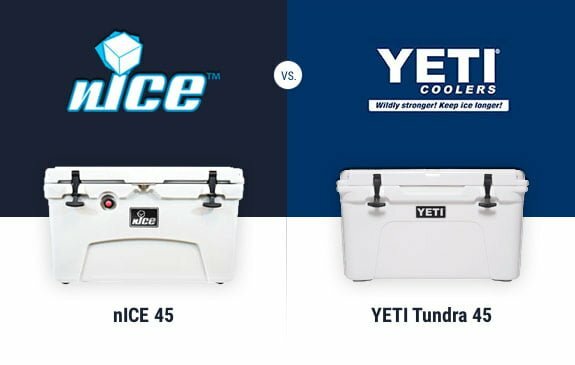 In the comments below let us know what you think about nICE Ice Chests, their extra features and who do you think is a winner in the nICE vs Yeti coolers battle. Recently came across a 45-qt seafoam green model at a Marshall’s/Homegoods discount store here in the northeast for $140 before tax. I was skeptical–had never heard of the brand, while the ‘Made in China’ stamp only raised the eyebrow farther–but the overall visual impression compared to the ubiquitous YETIs that abound at my dock and obvious built-in features that are mentioned in your review prompted me to go for it; if nothing else, I’d have a distinctly-colored if mediocre ‘super-cooler’ for relatively short money. I haven’t yet really put it to the ice-retention test–it’s been an abnormally cool, rainy late Spring/early Summer up here–but I do look forward to at least good performance compared to the way-out-of-date Igloo I’ve been using for years now. I just grabbed one for $129 at Homegoods in Fl. Cool color, too! Just purchased a seafoam green 38qt Nice, today at Marshalls, $129. I had not even heard of this brand, but it looked very solid and had a five year warranty. 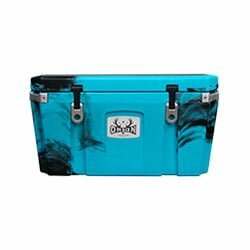 I wanted the Yeti bag type cooler, that they have have in the past, but they didn’t have any. With luck I found this one in the area of the summer outdoors things, can’t wait to check it out. Found it had a good review after I checked it out on the Internet. Wal-Mart does carry a few. After reading this review I just ordered the 22qt in the electric blue color. They are selling it for $73.50 at Walmart.com right now. It’s funny the 20qt cost about $50 more than the 22. Can’t wait to get it in next week.